If you are in charge of planning a twin shower and are looking for cute and clever twin ideas, don't you worry - we are here to help! Hosting a twin baby shower doesn't require much more work than a traditional baby shower! We have a bundle of ideas for wording for twin invitations, pictures of twin cakes, twin baby shower decor ideas and twin baby gifts! We even have some adorable pictures of twin and triplet baby shower invitations. See our Pea In A Pod Theme Page for more ideas! Other popular "twin themes" are Noah's Ark or Two Shooting Stars. My sister had twin girls and my mom and I had a blast coming up with cute and creative ideas to make it a shower to remember! We chose the "2 Peas in A Pod" theme and the guests loved it! 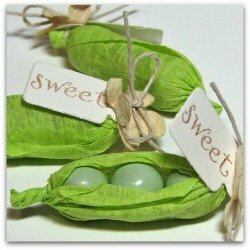 There were green jelly bellies (peas) in candy dishes, we wrapped two bath bombs in green cellophane to make "pea pod" favors and then we made a pea pod centerpiece. 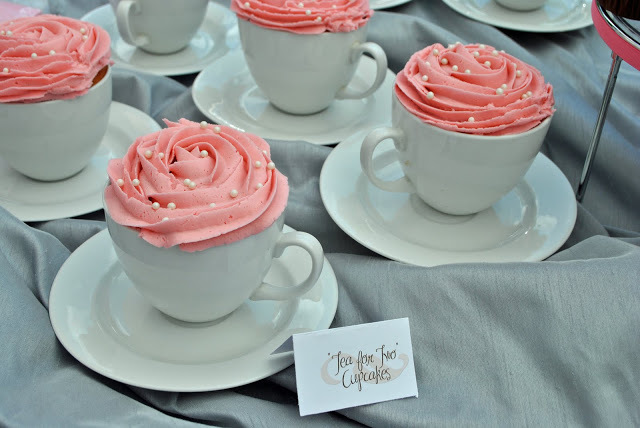 A "tea for two" baby shower tea party makes an adorable twin baby shower theme! Gather an assortment of cute, whimsical tea cups and saucers, brew some yummy tea, make some tea sandwiches, a fruit salad and some veggies and dip - and there you have the perfect twin tea party! 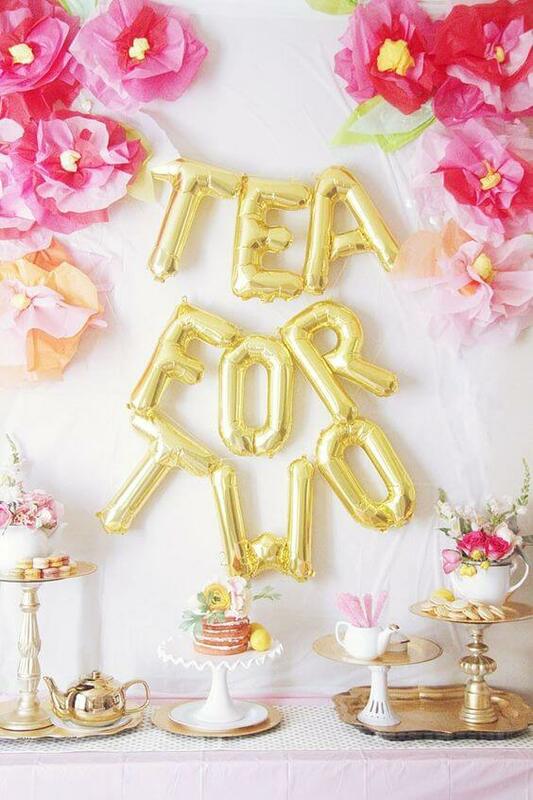 For decor you can hang the letter-shaped balloons that are all the rage lately - spell out "tea for two", or something as simple as the word, "twins." Serve up some beautiful "tea for two" cupcakes in teacups (check thrift shops or the dollar store to find great deals on tea cups.) rose shaped icing nozzle. Make your planning easier with tons of twin printables! Get adorable ideas for hosting a "Thing 1 & Thing 2 Twin Baby Shower!" We recently featured this cute shower theme on our site - see all of the inspiring pictures and decorating ideas here! 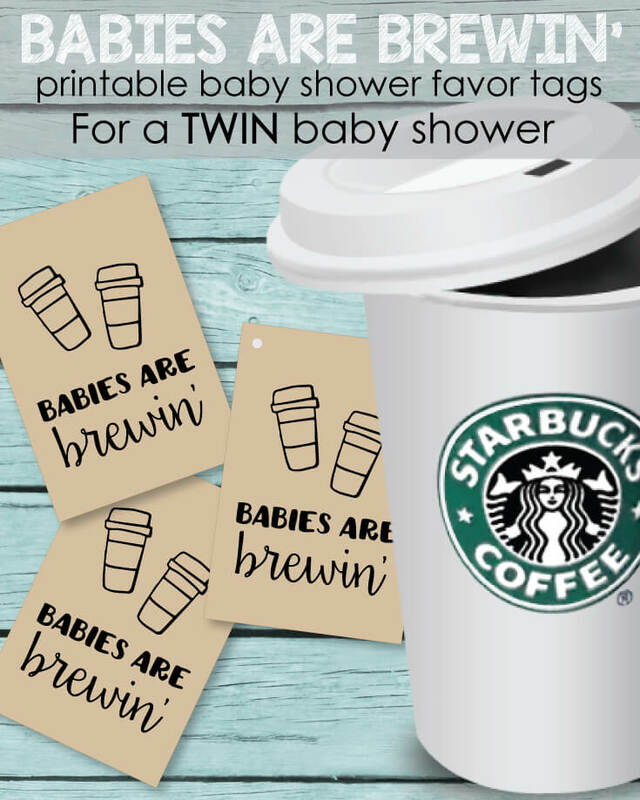 There are so many creative twin baby shower supplies, party favors, decorations and invites that cater to twin showers! Below you will find an extensive list of twin shower ideas to give you some unique ideas and inspiration! We gathered all of our favorite twin baby shower ideas, decorations, supplies and favors! Babies, pea pods and monkeys galore! 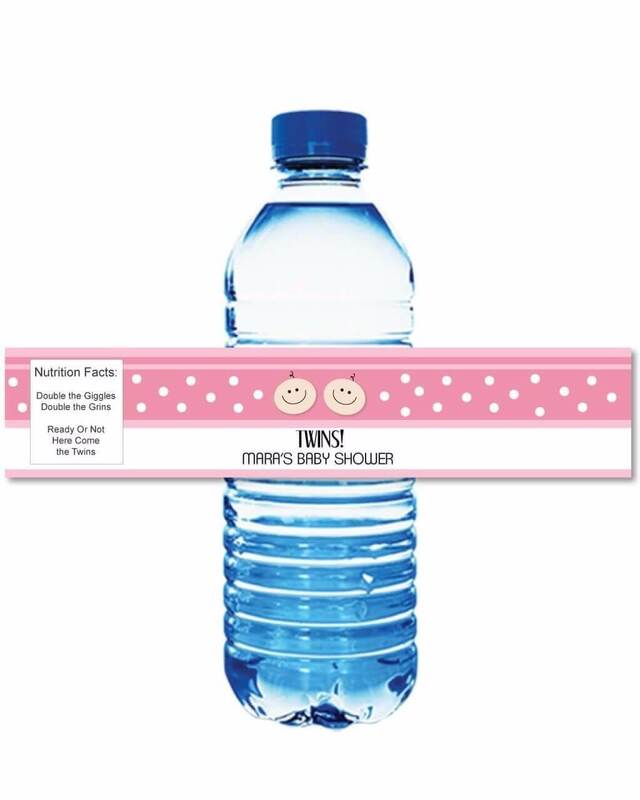 We whipped up these twin water bottle labels for you! There are all sorts of fun colors such as pink, blue and a pink/blue combo for boy/girl twins! The Nutrition Facts on label reads: Double the Giggles, Double the Grins. Ready or not, here come the twins! 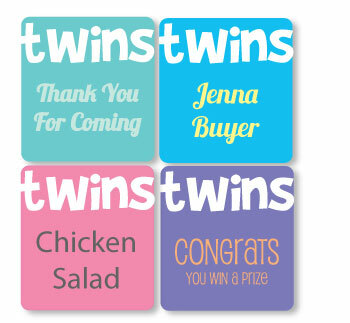 Show guests your creative side by handing out twin baby shower favors! Hosting a twin (or triplet) baby shower is a rewarding experience. You get the chance to be creative and come up with cute ideas that you don't see at other baby showers. Not feeling creative? Don't worry! We have come up with some extra-cute ideas for you! It is good practice to give guests favors as they leave, thanking them for coming to the baby shower. 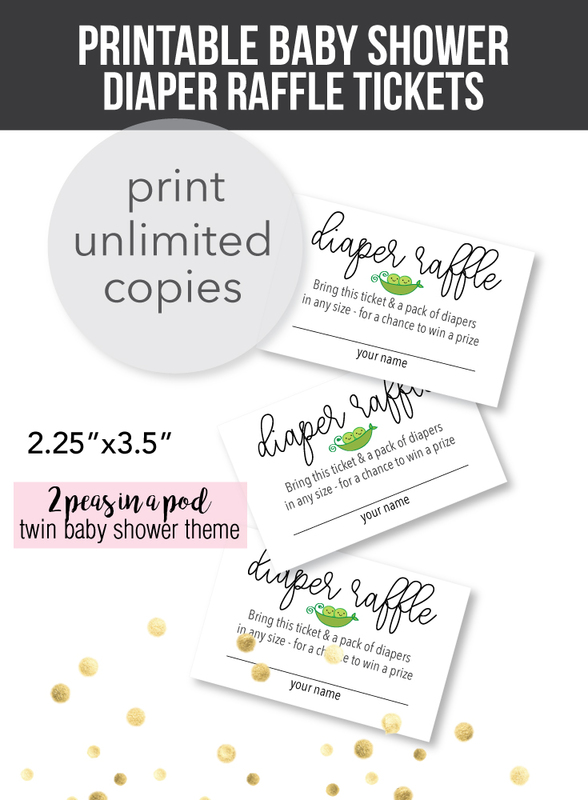 Leave a lasting impression by giving out-of-the-ordinary twin baby shower favors! These cuties are so simple to make and will have guests talking about them for months! But don't take out word for it! Take a peek by clicking on the link! Get 2 little star cookie cutters (per guest) and wrap them up in tulle or cellophane. Tie with a cute bow and a note that says "two shooting stars" or "two stars are born." "2 peas in a pod" or "bottles, bibs and diaper pins....can you believe Anne's having twins!" Or just the shower information such as the date and the mother-to-be's name. Bundle up two tea bags in an organza bag and attach a cute note saying "twins are a brewin'" So cute! Using pink or blue votive candles, wrap two in cellophane and tie with a ribbon. Add a cute tag which says: twins are double the fun! Wrap up some "Double" mint gum in cellophane and tie with a ribbon for a simple and cute favor idea! Still looking for more cute favor ideas? Visit our Baby Shower Favors page. Many of the ideas there can be adapted to fit a twin or triplet theme ~ Simply multiply the items! Twin Baby Shower Poems - More fun twin baby shower ideas! See a whole page full of sweet twin baby shower poems to use on invitations, wording for cakes & baby announcements! Tons of cute ideas to inspire you! Adorable Twin Baby Shower Ideas for Cakes - These cute and clever cakes will amaze you! ...And they have all been submitted by our readers! Take a peek! If 2 are due, here is what to do: I consulted with my sister on this one since she has twins! When buying gifts for a twin baby shower, some things need to be bought in multiples, but not all. For example, they will definitely need 2 swings, but they won't necessarily need two baby bathtubs. 2 bouncy chairs - these are lifesavers! Babies love the vibrating ones! Oh and last but not least...a nanny! Let us know if you have any ideas for "must have" Twin Baby Gifts!